As delicious as the court jester of the sausage world can be, fast food hot dogs are rarely worth the asking price. 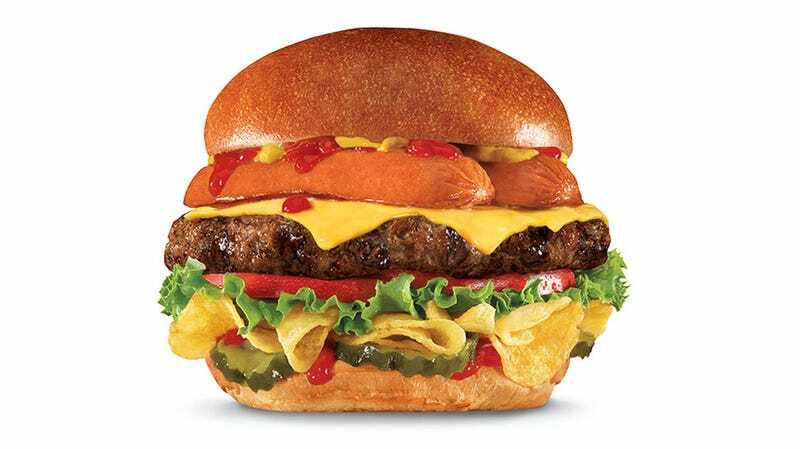 Carl’s Jr. and Hardee’s have come up with an elegant solution to this age-old problem—they’ve turned the hot dog into a topping. I love a good hot dog. Hell, I love a bad hot dog. Some of the best hot dogs I’ve had have spent the better part of a day rolling on warm metal in a dirty gas station. It’s that dirt that makes them delicious, along with the fact that they rarely cost more than a dollar. The low cost and easy preparation of poverty’s answer to sausage is why fast food hot dogs have never sat right with me. I buy fast food burgers because the alternative is buying expensive-ish ground beef, forming patties, seasoning them and cooking them carefully so the resulting product doesn’t make me violently ill. If I want hot dogs I can purchase a pack of eight completely passable specimens for around $1.50. Adding buns and condiments, that’s eight hot dogs for around five bucks. For a fast food hot dog to be worth my time, it has to do something special. Putting stuff on it? That’s not special. Make it a foot long and we may talk. Dip it in corn meal and fry it on a stick? I can work with that. Slice it in half and put it on a burger with some kettle-cooked Lay’s potato chips? We’ll see. I love the idea of not having to choose between a hot dog and hamburger. I love chips on a burger, something I regularly do at family cookouts. I don’t like the Carl’s Jr. / Hardee’s Thickburger concept. Ordering one feels like abandoning hope. I also don’t appreciate the way Brad Haley, chief marketing officer of CKE Restaurants, feels he has to justify the hot dog burger by invoking bacon in the official press release. You know what else is not unlike bacon? Brad Haley, chief marketing officer of CKE Restaurants. The Most American Thickburger arrives in restaurants on May 20. If I can work up the nerve and get over my justified nausea, I’ll be there—for snack science.